INTERNATIONAL REPORT—IHG is expanding its presence around the world including an InterContinental—the brand’s 200th—built into the wall of a rock quarry in China, and properties in the Netherlands. InterContinental Shanghai Wonderland, the 200th InterContinental hotel, recently opened. Developed by Shimao Group and managed by IHG, it is a luxury hotel built into the side wall of a formerly abandoned quarry in Southwestern Shanghai. Stretching nearly 950 ft. underground, the hotel was nominated as one of the architectural wonders of the world by the National Geographic Channel’s MegaStructures series due to its pioneering architectural design. 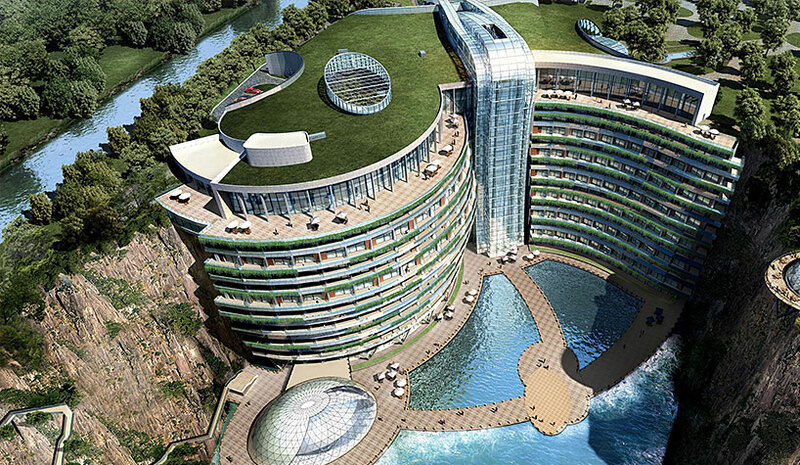 Located at Sheshan Mountain Range, this new hotel is mostly subterranean, with two floors above ground and 16 below ground, including two floors underwater. Individually designed to best reflect both modern elegance and the unique features of the quarry’s landscape, all 336 rooms and suites provide luxury living spaces with views of waterfalls and the surrounding cliffs. The underwater loft has two levels: the landing deck at water level houses the outdoor terrace and living room, and the underwater bedrooms are encased within a turquoise aquarium where guests will be surrounded by the schools of fish that swim by. IHG has opened its first Staybridge Suites in the Netherlands, Staybridge Suites The Hague – Parliament. Designed to meet the needs of extended-stay guests from business travelers to families, the hotel has 101 contemporary suites with fully equipped kitchens, comfortable living areas, and flexible workspaces. The layout and interior design is inspired by the city’s rich history and environment. The hotel itself comprises three buildings, two of which are located on the central Lange Vijverberg. The historical design influence can be seen in the hotel’s use of paneling, brass finishing and a traditional color palette of rich deep blue and warm ochre. Connecting all three buildings together is a Parisian-style courtyard, adding to the ambiance of the hotel. The company has signed Kimpton Rotterdam, The Netherlands. The hotel is signed under a management agreement with Omnam Group, and is set to open in 2022. This is the second hotel for Kimpton Hotels & Restaurants in the country, and will be located in Rotterdam’s Post building, the city’s former main Post Office dating back to 1921, which today is part of a mixed-use project in the city center. When open, the hotel will have 231 guestrooms, created by ODA NY. The hotel will be developed and opened with Omnam Group, a real estate group and active investor with projects in the European hotel market. Omnam specializes in medium- to large-scale hotels, aparthotels, mixed-use developments and conversion opportunities, with destinations including Brussels, Amsterdam and Rome. Last year, IHG opened its first Kimpton hotel outside of the Americas, Kimpton De Witt, in Amsterdam. This was followed by the recent opening of Kimpton Fitzroy London, a flagship property for the brand located on London’s Russell Square. Next Article Who’s Buying, Selling, or Financing?